Five-year old Saroo and his older brother Guddu are trying to earn some money so they can buy milk for the rest of their family. Their father is no longer part of the family. Their mother Kamla (Priyanka Bose) works and does the best she can but with two younger children she depends on Guddu and Saroo. Saroo begs his brother to let him go along to do some work at night and Guddu eventually relents. When they are at the train station, Saroo falls asleep. Guddu tells him to remain on the bench where he is and he will return for him. Saroo awakens, goes onto a train to look for Guddu and falls asleep again. When he wakes up, the train is moving and he is locked into the compartment. Since the train has been decommissioned, no passengers board during the two day journey to Kolkata (still known as Calcutta at that time). Saroo finds himself alone nearly 1,500 kilometers away from his home. It was 1986 and all he knew was that he was from Ganestalay, which no one could find on the map and that his mother’s name was “Mum.” As a result he wound up in an orphanage. After no one comes forward to claim him, he is adopted by an Australian couple, John (David Wenham) and Sue Brierly (Nicole Kidman). They will go on to adopt another child from the orphanage, Mantosh. The adoptive parents love both boys but while Saroo is an ideal child, Mantosh has some issues. Fast forward to the adult Saroo (Dev Patel) going off to learn hotel management as a prestigious institution. There he meets “Lucy” (Rooney Mara) and they fall in love. 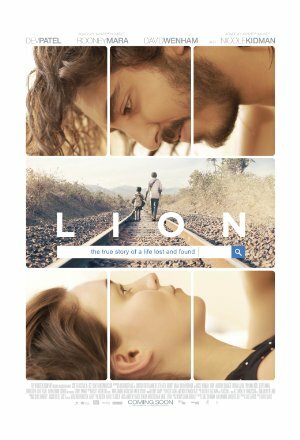 Saroo tells their friends the story of how he became separated from his mother and family and they encourage him to search for his mother. They suggest that he use Google Earth and what was once just occasional dreams and visions becomes an obsession for Saroo. It causes tension in his relationships with Lucy and with his parents. While the facts of Saroo’s story were told quite well in his 2012 book “A Long Way Home,” best that the rest of that story be experienced by seeing the movie or reading the book. This is the feature film debut of Garth Davis but he makes few, if any, rookie mistakes. Both Nicole Kidman and Dev Patel deliver performances that were well worth the Golden Globe nominations they received. The major surprise is the amazing acting from Sunny Pawar who plays the young Saroo. Look for big things from this young actor. In addition to the powerful feelings that Lion generates, it is lovely to look at, without too much of anything and just enough of everything. The few close-up shots are made more effective by their scarcity. Hunt down a screening of Lion near you.